The story began in 1798 when Portuguese wine merchant, Bruno da Silva, made a journey from Oporto to England where he imported wines from his native land to London. He married an Englishwoman and settled into the English way of life, establishing business relationships and buyers for his wines. When the Napoleonic Wars threatened his position as a wine merchant he applied for “Royal Assent” to equip a merchant ship with guns in order to secure the safe transport of his Port. Many other Port houses suffered because of the war and their inability to ship wines safely. However, Bruno da Silva’s company became the only Port house to ever transport casks of fine Ports under its own armed protection across the Bay of Biscay. 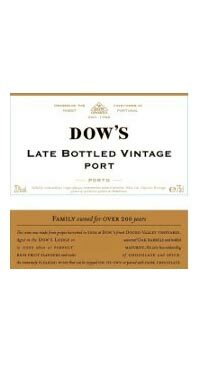 The Dow legacy lives on and this house is known for producing very concentrated and tannic bottle aged Ports that after many years, mature towards exotically scented supple velvety wines. Their Ports tend to finish on the drier side than most. This is considered by many to be one of the best LBV Ports available. Concentrated dark cherries, chocolate and spice aromas and flavours. Full and warming with a pleasing finish that tends towards the drier side. Enjoy this with cheese and dark chocolate.